Brad Pitt's BFF was as shocked as we were. George Clooney was blindsided when he was told of Brad Pitt and Angelina Jolie’s divorce during a live television interview. The public was left shocked when it was revealed that Angelina had filed for divorce from her husband, citing irreconcilable differences, and was asking for custody of their six children. 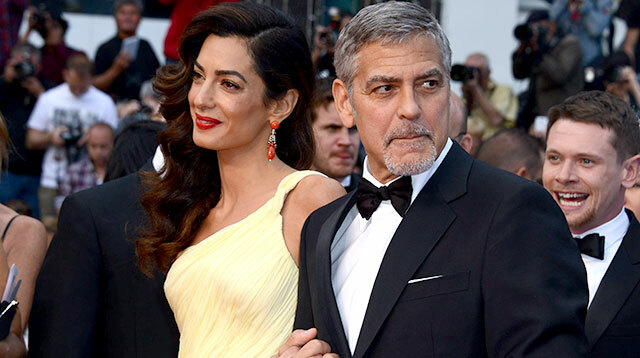 However, one of the last people to find out appeared to be Brad's Ocean's Eleven co-star and BFF George, who was attending an event at the United Nations. During a live interview with CNN, anchor Richard Roth asked the actor: "Alright, don't shoot me on this last question but you're friends with both of them. Any thoughts?" A confused George asked: "What's that? What's happened?" After Roth informed him of the divorce news, George struggled to conceal his shock as he replied: "I didn't know that. I feel very sorry then. That's a sad story and unfortunate for a family… It's an unfortunate story about a family. I feel very sorry to hear that. That's the first I've heard of it." After starring with Brad in 2001's Ocean's Eleven, George formed a close bond with the actor and later also became friends with Angelina. George was at the UN on Tuesday attending a round table event with U.S. President Barack Obama to discuss the ongoing refugee crisis. After the divorce went public, Brad released a statement saying: "I am very saddened by this, but what matters most now is the well-being of our kids... I kindly ask the press to give them the space they deserve during this challenging time." Brad and Angelina wed in 2014. The couple met on the set of 2005 action flick Mr. & Mrs. Smith, when Brad was still married to Jennifer Aniston.